1. What is DBMS ? The database management system is a collection of programs that enables user to store, retrieve, update and delete information from a database. 2. What is RDBMS ? Relational Database Management system (RDBMS) is a database management system (DBMS) that is based on the relational model. Data from relational database can be accessed or reassembled in many different ways without having to reorganize the database tables. Data from relational database can be accessed using an API , Structured Query Language (SQL). 3. What is SQL ? Structured Query Language(SQL) is a language designed specifically for communicating with databases. SQL is an ANSI (American National Standards Institute) standard. 4. What are the different type of SQL's statements ? DDL is used to define the structure that holds the data. For example, Create, Alter, Drop and Truncate table. DML is used for manipulation of the data itself. Typical operations are Insert, Delete, Update and retrieving the data from the table. The Select statement is considered as a limited version of the DML, since it can't change the data in the database. But it can perform operations on data retrieved from the DBMS, before the results are returned to the calling function. DCL is used to control the visibility of data like granting database access and set privileges to create tables, etc. Example - Grant, Revoke access permission to the user to access data in the database. 5. What are the Advantages of SQL ? 1. SQL is not a proprietary language used by specific database vendors. Almost every major DBMS supports SQL, so learning this one language will enable programmers to interact with any database like ORACLE, SQL ,MYSQL etc. 6. what is a field in a database ? A field is an area within a record reserved for a specific piece of data. Examples: Employee Name, Employee ID, etc. 7. What is a Record in a database ? A record is the collection of values / fields of a specific entity: i.e. an Employee, Salary etc. 8. What is a Table in a database ? A table is a collection of records of a specific type. For example, employee table, salary table etc. 9. What is a database transaction? 10. What are properties of a transaction? 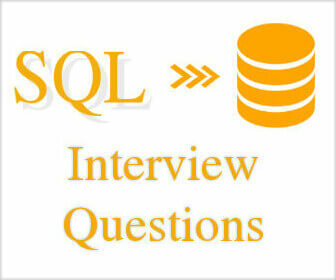 Expect this SQL Interview Questions as a part of an any interview, irrespective of your experience. Properties of the transaction can be summarized as ACID Properties. A transaction consists of many steps. When all the steps in a transaction get completed, it will get reflected in DB or if any step fails, all the transactions are rolled back. The database will move from one consistent state to another, if the transaction succeeds and remain in the original state, if the transaction fails. Every transaction should operate as if it is the only transaction in the system. Once a transaction has completed successfully, the updated rows/records must be available for all other transactions on a permanent basis. 11. What is a Database Lock ? Database lock tells a transaction, if the data item in questions is currently being used by other transactions. 12. What are the type of locks ? When a shared lock is applied on data item, other transactions can only read the item, but can't write into it. When an exclusive lock is applied on data item, other transactions can't read or write into the data item. 13. What are the different type of normalization? In database design, we start with one single table, with all possible columns. A lot of redundant data would be present since it’s a single table. The process of removing the redundant data, by splitting up the table in a well defined fashion is called normalization. A relation is said to be in first normal form if and only if all underlying domains contain atomic values only. After 1NF, we can still have redundant data. A relation is said to be in 2NF if and only if it is in 1NF and every non key attribute is fully dependent on the primary key. After 2NF, we can still have redundant data. A relation is said to be in 3NF, if and only if it is in 2NF and every non key attribute is non-transitively dependent on the primary key. 14. What is a primary key? 1. No two rows can have the same primary key value. 2. Every row must have a primary key value. 3. The primary key field cannot be null. 4. Value in a primary key column can never be modified or updated, if any foreign key refers to that primary key. 22. What are wild cards used in database for Pattern Matching ? SQL Like operator is used for pattern matching. SQL 'Like' command takes more time to process. So before using "like" operator, consider suggestions given below on when and where to use wild card search. 1) Don't overuse wild cards. If another search operator will do, use it instead. 2) When you do use wild cards, try not to use them at the beginning of the search pattern, unless absolutely necessary. Search patterns that begin with wild cards are the slowest to process. 3) Pay careful attention to the placement of the wild card symbols. If they are misplaced, you might not return the data you intended. 23. Define Join and explain different type of joins? Self-join is query used to join a table to itself. Aliases should be used for the same table comparison. 25. What is Cross Join? Cross Join will return all records where each row from the first table is combined with each row from the second table. 26. What is a view? The views are virtual tables. Unlike tables that contain data, views simply contain queries that dynamically retrieve data when used. 27. What is a materialized view? Materialized views are also a view but are disk based. Materialized views get updates on specific duration, base upon the interval specified in the query definition. We can index materialized view. 28. What are the advantages and disadvantages of views in a database? 1. Views don't store data in a physical location. 2. The view can be used to hide some of the columns from the table. 3. Views can provide Access Restriction, since data insertion, update and deletion is not possible with the view. 1. When a table is dropped, associated view become irrelevant. 2. Since the view is created when a query requesting data from view is triggered, its a bit slow. 3. When views are created for large tables, it occupies more memory.